SACRAMENTO, Calif. (CN) – California utility giant Pacific Gas & Electric on Thursday promised to turn off electricity in wildfire-prone areas when wind and other factors could abet the rapid spread of a blaze. PG&E announced that provision and several others as it grapples with the fallout from a series of wildfires in Northern California last October that killed 44 people and have so far led to $10 billion in insurance claims. 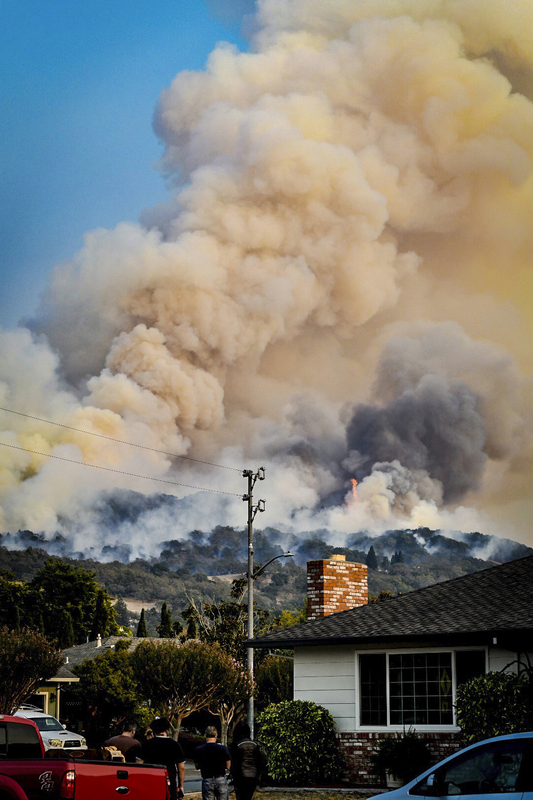 “All of us need to work together to make decisions and put in place solutions based on the dynamics of climate change and severe weather events,” said Pat Hogan, an executive with the PG&E’s electricity management division. The new safety provisions appear to be in response to the Wine Country fires. Cal Fire has yet to determine a cause for the approximately 250 wildfires that broke out last October. The fires scorched about 245,000 acres across several counties in Northern California. But emergency dispatches point to downed power lines as a probable cause, and numerous lawsuits against PG&E have already been filed. The California Legislature recently held a hearing urging the utility company to update its safety provisions. Along with pre-emptive electricity shut-offs, PG&E will replace old power lines with newer, stronger coated lines and space them farther apart to prevent line-on-line contact. The company plans to increase vegetation management and disabling circuit breakers in high-risk areas during fire season. Many of the initiatives come at the behest of state lawmakers who challenged PG&E to enhance its wildland fire mitigation during a hearing conducted in January. Of all the new measures, the most controversial is turning off electricity during high-wind events. San Diego Gas and Electric turned off power to more than 19,000 customers in December 2017 while the wind-driven Thomas Fire burned nearly 200 miles to the north. Doing so incurred the wrath of several customers and some politicians. San Diego County Supervisor Dianne Jacob called on the California Public Utilities Commission to investigate. She further said shutting off power can cut people off from evacuation notices and other vital fire-related information. Nevertheless, utility, fire and other public safety officials say the practice could be the best way to prevent a firestorm like the ones that broke out across Northern California this past fall. PG&E is eager to point out Cal Fire has yet to conclude its investigation. But the moves announced Thursday indicate the utility’s concerns about potential liability associated with the most expensive wildfires in California’s history. PG&E has seen its stock price decline by 40 percent since the fires, and recently said it would suspend dividend payouts to investors – a move expected to save the company $250 million annually. Reportedly, its lobbyists have been busy in Sacramento working to change liability laws so utilities will not have to foot the bill for reconstruction of areas ravaged by wildfire. Specifically, PG&E and other utilities oppose the legal principle of inverse condemnation, which allows them to be held liable even if the fires were not created by a failure to maintain equipment or other forms of gross negligence. The lobbyists’ efforts appear to be working.